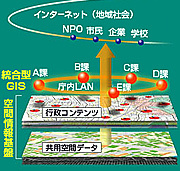 Building and adopting integrated GIS | Geospatial × ICT | Our Business | Kokusai Kogyo Co., Ltd. Integrated GISs act as platforms for distributing geospatial database and help achieve communication within and between government agencies and local communities. By handling administrative data as geospatial information having a close relationship to geographical positions (locations and ranges), integrated GISs support efficient operations and enable government agencies to provide new administrative services. With extensive experience in building and introducing integrated GISs, Kokusai Kogyo provides total support, from creating basic plans for introduction and building shared spatial databases, to introducing and operating a high-functionality WebGIS that can be used by all government agencies. We build shared spatial data in a hybrid format (maps roads and buildings, which form the basic geospatial information, with high positional accuracy), providing the greatest benefit at the lowest cost. WebGIS is based on the latest ICT and provided with advanced functions, to improve the efficiency of government operations that utilize geospatial information. Visualized data provided by an open WebGIS results in non-stop services with excellent accessibility for local residents. Our integrated GIS applications support increased operational efficiency, by making it possible to view, input, output, and utilize business data from governmental agency departments, including shared spatial data, from within agency networks. Our open Internet applications contribute to governmental transparency and the improvement of service to residents by providing map information in a visual format to residents over the Internet. Secure data linkage can be performed between these applications, making it possible to release information used within agencies to the public in a timely fashion. We can also create custom applications in line with specific governmental operation needs, such as facility management or core operations, providing solid operation support. The SonicWeb series is composed of the following diverse lineup, providing support for diverse customer needs. SonicWeb is an ActiveX plug-in general-purpose Web-GIS supporting high-speed map drawing, ease of use, and advanced functions. SonicWeb-i is a general-purpose GIS in a non-plug-in format, providing advanced operation support over intranets via web browser alone. SonicWeb-ASP is a map ASP service that is open to the general public and requires no installation, facilitating the disclosure of administrative information.